Airlink sticks to their name by linking South Africa’s small towns with larger cities by creating an efficient network of feeder routes. Experience the heart of the African bush when you sign up with the ‘Lodge Link Network Programme’, which takes you straight to the private lodges. The higher you fly, the greater your privileges – if you fly frequently with Airlink, you will be rewarded with voyager miles! As part of a strategic partnership with South African Airways and SA Express, it is no doubt that Airlink, as an African regional carrier, is one of the leading airlines in South Africa. With a key focus on on-time departures and punctual arrivals, Airlink’s commitment to service excellence is unrivalled by most other regional airlines within Southern Africa. The airline also currently has the widest network and choice of flights from the most popular routes in Southern Africa to the lesser travelled destinations that you’ve always wanted to see. Plus, the good news is Airlink is a member of the South African Airways Frequent Flyer Programme "Voyager", so you can double up on your rewards when you fly with the airline. Airlink is also the only airline that will be offering cheap flights to Saint Helena in the near future. Did you also know that Travelstart is Airlink's Number One Agency in South Africa? Airlink flies to and from Mthatha Airport (UTT). Book your cheap flights to George, Nelspruit, Skukuza, Port Elizabeth and other exciting places! While the Airlink fleet is smaller than most commercial airliners, they haven’t scrimped on baggage allowances. • If you’re flying Economy Class on Airlink, then the usual 20kg baggage allowance applies. • Business Class passengers are entitled to 30kg baggage allowance. • Children and Infants paying at least 50% of the adult fare are entitled to the same baggage allowance as adults. • Infants not entitled to a seat shall only be permitted 10kg and one collapsible stroller. 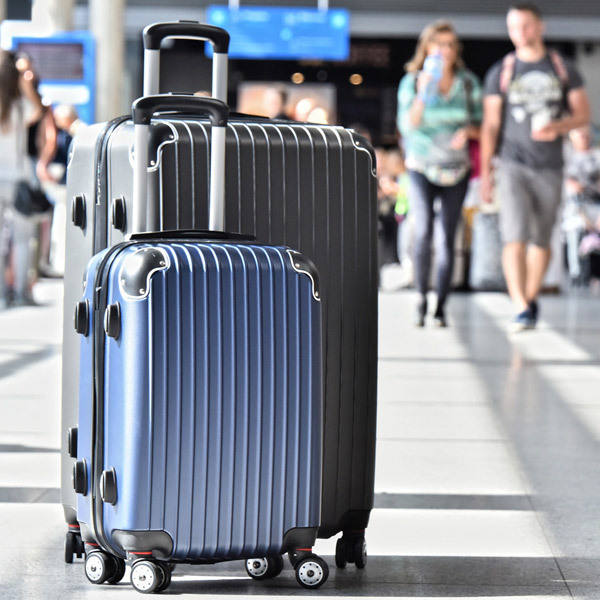 For carry-on luggage, your bags cannot exceed 8kg. Business Class passengers can carry two pieces of luggage onto the aircraft, and Economy Class passengers no more than one. Maximum dimensions for one piece is 52cm x 20cm x 23cm. The size of one carry-on item can’t exceed the overall dimensions of 115cm. Check-in for domestic Airlink flights opens 90 minutes before departure and closes 30 minutes before take-off. For international or regional Airlink flights, check-in opens two hours before departure and closes 50 minutes before take-off. Always allow yourself ample time to check in before flying. You never know what kind of hold-ups you may encounter on your way to the airport, and Airlink has a strict ‘no refunds’ policy for passengers that fail to check in on time. Depending on your flight (domestic or regional), Airlink offers its passengers the option of Economy, or Business Class seating. Many smaller, domestic routes offer only one class cabin. With its hub at Johannesburg’s O.R. Tambo Airport, Airlink offers flights to smaller towns in South Africa and regional centres, with convenient connections through their alliance with SAA, SA Express and the Star Alliance carrier’s global networks, throughout Southern Africa and the world. Airlink connects South Africa with 36 destinations in 9 African countries. Whether you’re looking to fly direct to your mine in the depths of Zambia, or simply hop over to your favourite private game reserve for the weekend, Airlink flights take you there comfortably in one of its 31 aircraft. Their stylish fleet, reminiscent of a modern-day business tycoon’s private jet, consists of the 29-seater Jetstream 4100’s, ERJ 135 jet aircraft, Grand Cessna Caravan 208BEX, to the larger British Aerospace AVRO RJ85 that carries up to 83 passengers.